Chapter 3 - Transpersonal Anthropology: What is it, and What are the Problems we Face in Doing it? "Paranthropology: Anthropological Approaches to the Paranormal"
September 1, 2012 Journal of Consciousness Exploration & Research ("JCER," http://www.jcer.com) is a publication in which scientists, philosophers and other learned scholars publish their research results and express their views on the nature, origin and mechanism of consciousness. In doing so, we hope that one day we will be able to arrive at a genuine science of consciousness. This is JCER Volume 3 Issue 8 first published in August 2012. It is entitled "On Quanta, Consciousness, Creativity, Natural Psychedelic State, Physical Realm & Paranthropology" and contains the following Articles: (1) A Possible Quantum Model of Consciousness Interfaced with a Non-Lipschitz Chaotic Dynamics of Neural Activity (Part I); (2) A Possible Quantum Model of Consciousness Interfaced with a Non-Lipschitz Chaotic Dynamics of Neural Activity (Part II); (3) The Creative & Persecuted Minority I: An Artful Look at Science & a Scientific Look at Art; (4) The Creative & Persecuted Minority II: The Nature of the Creative Process; (5) A Retrospective Commentary on the Consciousness Mapping of John C. Gowan Part I; (6) A Retrospective Commentary on the Consciousness Mapping of John C. Gowan Part II; (7) Extension of the Physical Realm; (8) Reissner's Fiber, Quanta & Consciousness; and (9) A Transdisciplinary Look at Paranthropology: An Emerging Field of Exploration. 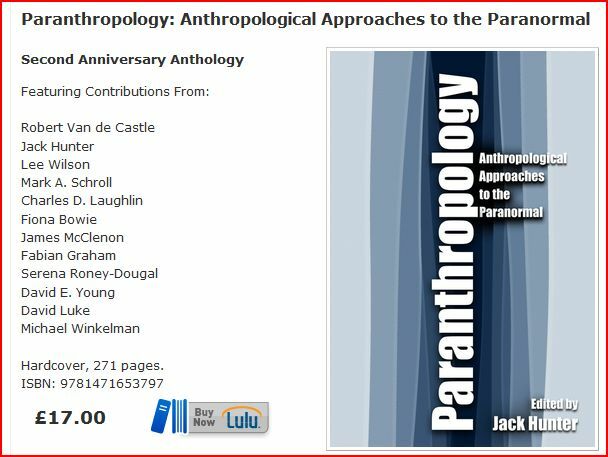 Abstract: Paranthropology: Anthropological Approaches to the Paranormal collects the best articles from the first two years of the journal's publication. It describes a quiet yet relentless revolution going on within the life and social sciences and arts. While physicists, biologists, medical doctors, and psychologists have commented for years on anomalous experience, anthropologists maintained a largely conventional observer attitude within their field. Most avoided the risks of "going native" by suspending professional orientation and experimentally entering a participatory mindset to describe their host cultures from the inside out. If researchers inadvertently experienced anomalous events in the field they were often as reluctant to admit them as professional pilots are to report UFOs. Even the most successful and well-respected "parapsychologists" have been reluctant to assume such a title. Perhaps their struggle was viewed as a cautionary tale by anthropologists thrown into the boiling pot of traditional shamanic practices, such as shamanic flight, paradoxical healing, warring sorcerers, and disturbing supernatural occurrences in field work. Such overdue efforts should be heartily welcomed by the transdisciplinary community. It becomes less a matter of surrendering authority to other fields than learning along with them. Anthropology has origins in the humanities, the natural sciences, and the social sciences. So does paranthropology. In the words of its editors, "Paranthropology: Journal of Anthropological Approaches to the Paranormal” is a free on-line journal devoted to the promotion of social-scientific approaches to the study of paranormal experiences, beliefs and phenomena in all of their varied guises. The journal aims to promote an interdisciplinary dialogue on issues of the paranormal, so as to move beyond the skeptic vs. advocate impasse which has settled over the current debate, and to open new avenues for inquiry and understanding." Keywords: Paranormal, parapsychology, anomalous experience, treatment philosophy, shamanism, transpersonal anthropology, clinical paranthropology, taxonamy of consciousness, neurophenomenology, temporal lobe lability, neuromythology, hypnosis, mutual hypnosis, physics, neurotheology, trance, dissociation, anomalistic psychology, anthropological matrix. The 2012 anthology, Paranthropology: Anthropological Approaches to the Paranormal celebrates pioneering exploration and attempts to lay down some basic principles for research, theory and practice, fusing humanities and science. The journal PARANTHROPOLOGY has broken through the wall of silence and dared to subjectively and objectively examine experiences formerly considered "supernatural" -- unexplainable personal and cultural phenomena. Ultimately, the central theme here is that we should ‘get inside’ our subject matter without self-delusional abandonment. A global, pre-modern, spiritual healing phenomenon known as shamanism may be one of the most significant discoveries expressing the nature of the transpersonal. Winkelman points out, "The universals of shamans, and other shamanistic healers, reflect something fundamental about human nature. The universals of alterations of consciousness and crosscultural manifestations of soul flight experiences, spirit and animal identities, healing and divination practices, and other aspects of shamanistic healers, reflect a biological basis." Mark A. Schroll defines paranthropology as, "our investigation into humankind's primordial practices for exploring alternate states, stations, and domains of awareness known as the anthropology of consciousness". Early anthropology had a disconfirmatory agenda toward anomalous experiences, even though informants reported stories concerning so-called psychic phenomena such as telepathic communication or out-of-body experiences. But anthropologists generally don't take such stories seriously, instead viewing them functionally or semiotically rather than as parapsychological "evidence" (Young). In Chapter 3, Laughlin tells us, "In the 1970s, concern with more existential issues such as experience, cognition, consciousness and symbolism began to shift from the wings to center stage. Concerns which were once considered marginal in interest, like performance, myth, healing, trance states, etc., became phenomena of prime concern to anthropologists, both in fieldwork and in theory construction. And it was in the midst of this reorientation that the transpersonal movement began to make some slight headway in anthropology. . .Transpersonal anthropology is simply the cross-cultural study of the psychological and sociocultural significance of transpersonal experiences. phases of consciousness enrich the religious system, and relating these experiences to invariant patterns of symbolism, cognition and practice found in religions and cosmologies all over the planet’ (Laughlin 1997). Through participating fully in the host culture, to the extent of accessing culturally relevant experiences, the transpersonal anthropologist is able to gain a perspective on a particular culture that could not be attained through any normal means of objective observation." Indigenous people don't consider such phenomena supernatural as non-ordinary experiences are part of their natural world. They perceive nothing abnormal about the underlying nature of reality, a world occupied by spiritual beings, non-physical intelligences and paranormal powers. Such distinctions are cultural constructs that help us discern and see through our own constructs about life, death, and the afterlife. Polyphasic cultures recognize the importance and value of other states of consciousness for their individual and community psychological wellbeing and connection with their habitat. Anthropology has shifted its focus from attempting to explain away supernatural beliefs to an approach that accepts the significance of subjective anomalous experience in the development of such beliefs without applying a reductive interpretation, Hunter says. The contention is that immersive anthropology facilitates cognitive empathic engagement so one "sees what the natives see". Scientists exploring consciousness risk being transformed in the process of exploration. Regardless of nomenclature, supernatural, paranormal, extraordinary or anomalous experiences are assigned the umbrella term, 'psi' phenomena, which includes various types of "inner power". Social psychologist and parapsychological researcher Daryl Bem defines psi as ‘anomalous processes of information or energy transfer that are currently unexplained in terms of known physical or biological mechanisms'. Whatever they represent, such experiences are intrinsic aspects of the natural world. Whether we acknowledge psi or not, new generations of anthropologists will continue to encounter instances of psi / spirit during their field research. "Thus it [psi] is a transformative, ecstatic, or transpersonal encounter within us and our relationship and/or co-evolution with planet Earth and all its creatures. Including (to the extent it is possible) an awareness of our co-evolution with the universe, space-time, matter and consciousness (Krippner and Schroll, 2011). "[S}econd sight [is] a psychic ability that has for centuries been believed, in Scotland and other traditions, to be hereditary. The ability manifests itself through the person having spontaneous vivid imagery through different senses which apparently gives information about a spatially or temporally distant event. A total of 130 family histories were constructed and examined using segregation analysis. Second sight seems to be consistent with an autosomal dominant mode of inheritance, particularly for small family sizes. People with the trait were also evenly distributed with respect to their birth order position, in line with the expectations of a genetic model. It is argued that if other studies find a similar mode of inheritance in other cultures, then second sight could be a creative mental ability where the hereditary aspect lies in the sensitivity of the sensory systems which convey the experiences." All cultures have their taboos, and this scientific taboo has long separated the investigator from the very object of his or her observation. Transparency, rather than objectivity becomes the goal. Immersive or participatory excursions are balanced by systematic comparisons with the spectrum of possible interpretations. Hopefully, the participation of a few well-respected individuals from a variety of fields will inspire future generations of anthropologists to courageously open their minds and psychic boundaries. Paranthropology faces many of the same challenges encountered in "blue sky" parapsychology and paraphysics before such subjects were tentatively "re-admitted" to the conventional study and literature of their respective fields. Military interests drove much of the work in the former disciplines, but anthropology and sociology do not share in that funding or clandestine development. Because the content of these "fringe" areas is controversial is no reason to banish its investigators to the margins of serious inquiry. In fact, such explanatory gaps have the most to teach us about the deep nature of reality and our being. (ASC). They are based on cross-cultural methodology and a neurophenomenological perspective. Shamanic altered states inevitably incorporated dream processes by engaging in overnight rituals that first prevent sleep by hours of dancing, drumming and singing; after exhaustion, the participants then collapse into vivid dreamlike states. Ritual has the potential to produce an activation of lucid dreams. Lucid dreams engage an interaction between waking and dream consciousness that can produce cognitive integration and therapeutic outcomes, reflecting a greater awareness of the information-processing capacities of the unconscious, involving pre-egoic and prelinguistic levels of symbolization (Laughlin, McManus & d’Aquili 1992). In the past, each science functioned like a reality tunnel, directing what could and could not be looked at without peer approval and consensus. Each had little to do with other specialties or departments. Every science also comes with its own mythologies as well as models. Science likes to call them "assumed truths," but unconscious aspects can be as or more influential. Neuromythologies support the new materialism which may or may not be able to allocate certain functions and behaviors to particular areas of the densely interconnected brain or genetic structure. Myths express deep existential concerns that have consequences for human behavior. They have imaginal and philosophical elements and interpretations which may contain some objective truth. The pejorative term is normally applied to numerous woo woo ideas surrounding the brain, psychology, and neuroscience. But it can be equally applied to those fields themselves, each of which functions as a culture with subcultures within the system. Where is the anthropology of science being done, with the possible exception of philosophy of science? Cultural practices essentially generate and embody group trance states (consensus) in primitive and sophisticated societies. Cognition constrains culture in producing science. Mythologizing also arises in the popularization of scientific findings, which are misconstrued and misapplied by the public. In this view, brain-based approaches require the same scrutiny as those experiences traditionally allocated to the "supernatural". More specific framing doesn't necessarily lead to a better evidential basis. Educational practices which claim to be concomitant with the workings of the brain may or may not do so. No science or even the arts can continue to exist in isolation from the others with which it is holistically related and informed. Progress in other fields can be shared with good effect in a free exchange of information. Luminaries and lesser-known authors can shortcut their process by assimilating relevant results from the entire landscape of academic studies, while re-contextualizing their observations and conclusions in light of such information. Such readily-available specialty journals facilitate the free exchange of information by filtering and condensing the available material. Anthropology cannot objectively examine cultures without taking the worldview, including supernatural beliefs and spiritual technologies of such cultures into consideration, and they must do so in a multi-disciplinary fashion. That is, the nuances of consciousness and culture can be described from several different frames of reference, some of which lie beyond the normal scope of practice in anthropology. But a comprehensive study of man and consciousness is in no way limited to that. Consciousness and its many forms remains the conundrum that unites physics, biology, and cultural studies. Some time ago, Bateson called for a theory of consciousness that is neither supernatural nor mechanistic. Current models of consciousness which depend upon coherence do not explain possession, dissociation, out-of-body experiences near-death experiences, and addictions, for example. Consciousness, thought, and culture are irreducibly welded together and form the basis of human adaptive skills. Consciousness studies spans a repertoire of specialties from neuroscience, to neurotheology, to creativity, to quantum mind, dreaming, transpersonal studies, and more. While psychologists have long examined parapsychological events with a cross-cultural eye, anthropologists themselves, with a few exceptions, have been ill-trained and reluctant to do so. In the vacuum, other experts and paraprofessionals have conducted their own investigations of anomalous phenomena in a wide variety of ethnic cultures. Parallels between shamanic and hypnotic phenomena include: fantasy-prone and dissociative characteristics; family tendencies in susceptibility suggestive of genetic contributions; developmental paths involving injury, illness, and trauma; a tendency for artistic production and cognitive flexibility; spontaneous out-of-body experiences; and the use of monotonous procedures that focus attention and limit conscious awareness. While it used to be found in a horizontal, geographical direction, in a global society, the frontier is found at the leading edge of all fields -- in frontier science. While that term used to be a pejorative, it now offers a valid arena for the unfettered growth of ideas, which may be critiqued and honed without risk of professional censure. Thus, Paranthropology Journal represents a real breakthrough for the field, providing leaders in this trend a peer-reviewed outlet for their innovative findings and a place to share methodology on how to proceed further. A revisioning of the psychophysical roles of ritual, symbol, experience and brain function offer a more well-informed basis for field observations of cultures and sub-cultures. Intelligent voices provide rigorous arguments that open new territory for investigations, as well as new ways of investigating old ground. Physics has shown us that at the most profound level, all experience is ultimately subjective. It therefore colors our observations, framing and reporting, particularly when it relates to models of human behavior. Biology has discovered that there are quantum and electromagnetic effects that condition our essential being. Neurotheology shows how such parameters modulate our beliefs and internal perceptions and interpretations of our experience of "reality". There is a relationship between symbols and the structure of the brain, a symbolic organ. The symbol-making potential of the pre-frontal cortex enabled extended family and social bonds. "Bootstrapping" accelerates this process. Genetics, epigenetics, and meta-genetics are not irrelevant and the same must be said for neuroplasticity, neurophenomenology, memes, and self-awareness. Rewriting the brain's potential means rewriting our own, including how we study and view the world and humanity around us. Gifted environments provide “a rich variety of representations”, “stimulating learning environments”, and "empowering environments" that foster specific paths of development in protective attentive envelopes. The whole arena of open-source online journals encourages such environments, allowing scholars from several arenas to actively come together and explore the ideas of one another without academic boundaries. Humans live in social groups that split and reform. Social and personal bonding also derive from the set-points of physiological systems which produce defining behaviors, including mirror neurons, the limbic system, and the anterior cingulate, to name a few. Affect, such as guilt, shame, pride, pain, conscience, memory, identity, social- and self-consciousness eventually shape societies. We are learning to understand mindsets though we are unable to effectively describe the consciousness that underlies and makes them possible. Psyche is not separate from society. Disorders of the self share much in common with disorders of culture. Societies act out the same sort of functional and dysfunctional patterns we find in individuals at a grander scale. It relates to our understanding of affect, beliefs, narrative, mythopoetics, cognition, the unconscious, imagination, wisdom, healing, etc. as they apply to all "ways of being" in the world. The questions of who and what humans are requires open-minded exploration in terms of the history of the universe, life and humankind. Integrating the information contained in the traumatic event allows for the functional reformulation of basic axioms (constants). “The world is a safe place,” violated, becomes “the world is not always a safe place, but when it is unsafe I can still cope.” “My self is predictable” becomes “my physical and mental self may vary, but I have the proper support to bring them back into a familiar state when necessary.” The reduction of uncertainty associated with the narrative update process reduces felt anxiety and psychophysiological stress. It is the cascade of beneficial psychological and physiological processes accompanying this reduction in anxiety and stress that accounts for the well-documented health benefits and increases in productivity attendant upon the construction of coherent self-relevant stories. "As a particular mode of critical thinking about the world and our place in it the remit of anthropology is not to reduce one form of life to another. Veena Das remarks that ‘anthropological knowledge is precisely about letting the knowledge of the other happen to me’ (1998:192). It is the interplay between forms of knowledge and diverse perspectives that holds my attention, the possibility of disclosure, discrepancy and insight generated from juxtaposition and reflection. The critical space for this engagement might be generated by the sceptical practice that I have attempted to outline here, an appetite for enquiry sharpened by the withholding of assent. A sceptical anthropology thus draws into question the grounds for all knowledge leaving only the play of ‘fluxes of knowledge’ (Deleuze 2006:50) and the acceptance of incessant enquiry as the only means of stabilisation in epistemic free-fall. The notion of sceptic, as the Spanish poet philosopher Miguel de Unamuno points out, ‘does not mean him who doubts, but him who investigates or researches as opposed to him who asserts and thinks that he has found’ (de Unamuno 1924)." and the like. The very best we can hope for, we believe, is to sensitize the discipline to the existence and legitimacy of transpersonal experiences, and the significance of an understanding of such experiences to an explanation of alien symbolic and religious systems. Those wishing to pursue paranthropology more deeply might enjoy The Trickster and the Paranormal, by George P. Hansen (2001), which covers psychic and deceptive practices of shamans and other magico-religious practitioners from both a field and laboratory perspective. A foundational work on the structures of consciousness and symbolic process, the classic by Laughlin, McManus & d'Aquili, Brain, Symbol & Experience: Toward a Neurophenomenology of Human Consciousness, is a must-read. Also of value to anthropologists and other researchers are taxonomies of consciousness, which function as orienting maps of inner experience and transpersonal consciousness. They systematically cover exotic cognitive factors and unusual powers and abilities, including the effects of trance, drugs, yoga, self-hypnosis, mutual hypnosis, meditation, brainwave feedback, dream consciousness, pathologizing, and more. Among the best are those by John Curtis Gowan (Trance, Art & Creativity), Charles Tart (Altered States of Consciousness), Michael Washburn (Ego & the Dynamic Ground), and Stan Grof (The Adventure of Self Discovery). Anthropologists have observed that taxonomies are generally embedded in local cultural and social systems, and serve various social functions. Altered States of Consciousness (ASC) lose their irrational character seen as alternative ways of gaining knowledge or framing reality that relate to ego dissolution or transpersonal development. They comparatively specify the amount of awareness and arousal involved, including combinations of self-awareness, environmental awareness, and spiritual awareness (Fischer). Paranthropology studies whether these states, including spiritual intelligence, are internally consistent or dependent on social or cultural factors. Transcendental awareness may be passive while conscious state expansion is active. Edinger, Fischer, and Washburn address transpersonal issues in social, psychological, and biological terms. Dr. Daniel Amen sums up the symptomology with ten defining points: 1). Disturbance of auditory sensation and perception; 2). Disturbance of selective attention of auditory and visual input; 3). Disorders of visual perception; 4). Impaired organization and categorization of verbal material; 5). Disturbance of language comprehension; 6). Decreased long term memory; 7). Altered personality and affective development; 8). Altered sexual behavior; 9). Inability to perceive or remember events; 10). Damage to the inferior aspect of the temporal lobe – decreased memory in proportion to tissue damaged. Persinger and others have assembled Inventories and Questionnaires potentially valuable in establishing certain parameters in fieldwork (see Appendix A and Appendix B, this article). Such lists can help researchers target specific vectors by devising their own screenings. In conclusion, we hope to see many more provocative and insightful articles from Paranthropology, including theoretical and methodological contributions to the developing anthropology of the paranormal. While treatment philosophies and counseling are beyond the practice of most anthropologists, Clinical Paranthropology fosters awareness of how anomalous experiences may be related to or contribute to various health related issues. In paranthropology, the process of the experience is just as important as the exploration of the reported phenomena. Anomalistic Psychology means working with people in the clinical setting who claim to have had strange experiences and/or abilities that they could not explain. In paranthropology, the process of the experience is just as important as the exploration of the reported phenomena. Meanwhile, we can speculate on what kind of "work" would constitute "years of preparation" befitting a paranthropologist. There are likely as many answers and avenues as there are seekers. This is the essence of self-actualization and individuation. But Charles Tart suggests, "In point of fact, most spiritual systems have many ways in which they could be improved and have areas in which they have no answers or the wrong answers. Thus they need more research, they need an enlightened kind of science to broaden their horizons and make them more effective." Makarec, K., & Persinger, M. A. (1985). Temporal lobe signs: Electroencephalographic validity and enhanced scores in special populations. Perceptual and Motor Skills, 60, 831-842. Makarec, K., & Persinger, M. A. (1990). Electroencephalographic validation of a temporal lobe signs inventory in a normal population. Journal of Research in Personality, 24, 323-337. While sitting quietly, I have had uplifting sensations as if I were driving over a rolling road. I often feel as if things are not real. At least once, before falling down, I had an intense smell from childhood, apparently for no reason. Once, in a crowded place, I suddenly could not recognize where I was. I have had a vision. People tell me I "blank out" sometimes when we're talking. When relaxed or before falling asleep I sometimes feel pleasant vibrations moving through my body. Sometimes in the very early morning hours I have meaningful experiences. I have heard an inner voice call my name. I use hunches more than simple learning to solve new problems. Sometimes an event occurs that has special significance for me only. I have had experiences where I felt as if I were somewhere else. There have been brief times when I felt very close to a Universal Consciousness. I have had dreams of floating or flying through the air. At least once in my life I have felt the presence of another being. I have been taken aboard a space ship. I would like to time travel. When I have a tough decision a sign will be given and I will know what to do. If God told me to kill, I would do it in His name. I think there is a good possibility that I have lived a previous life. Telepathy is a real phenomenon. An inner voice has told me where to find something and it was there. Alien intelligence is probably responsible for UFOs. I have felt as if I have left my body. Ruttan, L. A., Persinger, M. A. & Koren, S. A. (1990). Enhancement of temporal lobe-related experiences during brief exposures to milligauss intensity extremely low frequency magnetic fields. Journal of Bioelectricity, 9(1), 33-54. I felt dizzy or odd. I felt the presence of someone or something near me. There were pleasant vibrations moving through my body. I heard an inner voice call my name or speak to me. The experience did not come from my own mind. I heard a ticking sound. I experienced terror or fear. There were odd tastes in my mouth. I felt as if I were somewhere else. I experienced thoughts from childhood. The same idea kept occurring. I felt as if I were spinning around. There were images from dreams I've had. The red light became brighter or darker. Amen, Daniel C. (1999). Change Your Brain, Change Your Life, Three Rivers Press; Reprint edition. Amen, Daniel C.(2008). Healing the Hardware of the Soul:How Making the Brain-Soul Connection Can Optimize Your Life, Love and Spiritual Growth, Free Press; Reprint edition. Edinger, Edward F.; ANATOMY OF THE PSYCHE, Open Court; LaSalle, Illinois, 1985. Gloor, P. (1982-1986). “Role of the Human Limbic System in Perception, Memory, and Affect: Lessons from Temporal Lobe Epilepsy,” Annals of Neurology, 12, 1982, pp, 129-144. Also in The Limbic System, Doane and Livingston (eds.). New York: Raven (1986). Hansen, George P., The Trickster and the Paranormal, 2001. Henry, Jane, Parapsychology, Research on Exceptional Experiences, Taylor and Francis(Routledge), 2004. Horgan, John (2003). Rational Mysticism. New York: Houghton Mifflin Company. Hunter, Jack (Ed), Paranthropology: Anthropological Approaches to the Paranormal, 2012. Kramer, Wim, Eberhard Bauer, and Gerd Hövelmann (Eds. ), Perspectives of Clinical Parapsychology : An Introductory Reader, Stichting Het Johan Borgman Fonds. Laughlin, Charles, John McManus & Eugene d'Aquili: Brain, Symbol & Experience: Toward a Neurophenomenology of Human Consciousness (1992, Columbia University Press). McKinney, Laurence O.(1994). Neurotheology: Virtual Religion in the 21st Century. Cambridge, Mass. : American Institute for Mindfulness. Persinger, M. A. (1975). “ELF Waves and ESP”; New Horizons, I(5), January 1975, pp.232-235. Persinger, M. A. , (1983). Religious and mystical experiences as artifacts of temporal lobe function. Perceptual and Motor Skills, 57, 1255-1262. Persinger, M. A., & Valliant, P. M. (1985). Temporal lobe signs and reports of subjective paranormal experiences in a normal population: A replication. Perceptual and Motor Skills, 60, 903-909. Persinger, Michael A. (1987). Neuropsychological Bases of God Beliefs. New York: Praeger Publishers. Persinger, M. A. and Makarec, K. (1987). “Temporal Lobe Epilsepsy Signs and Correlative Behaviors Displayed by Normal Populations,” Journal of General Psychology, 114, 1987, pp. 179-185. Persinger, M. A. , (1988). Temporal lobe signs and personality characteristics. Perceptual and Motor Skills, 66, 49-50. Persinger, Michael (1989). “Psi Phenomena and Temporal Lobe Activity: The Geomagnetic Factor,” in L.A. Henkel and R. E. Berger (eds. ), Research in Parapsychology 1988; Metuchen, NJ: Scarecrow Press, 1989. Walach, Harald, Stefan Schmidt, & Wayne B. Jonas (Eds) Neuroscience, Consciousness and Spirituality, Springer; 2011.